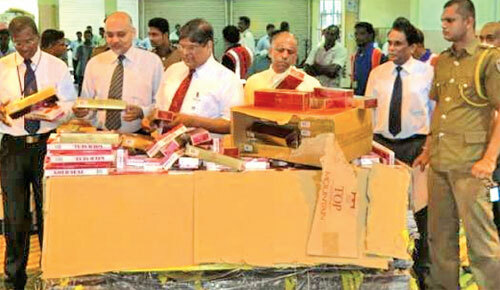 Customs sleuths at the Bandaranaike International Airport yesterday seized 2,250 cartons of cigarettes consisting 900,000 sticks valued at over Rs. 22.5 million, imported on a false declaration, addressed to a deceased person in Colombo 12. Customs Media Spokesperson Lesley Gamini said the importer of the consignment of 15 packages had submitted a false declaration to the customs saying the stock contained denim material weighing 1,393 kgs. The consignment which arrived on a flight on June 14 had been imported from Dubai. The consignee had also paid a cess of Rs.120,000. "However, after perusing the Customs clearance documents, the Deputy Director of Customs (Air Cargo) ordered the consignment to be examined. The consignee after being informed never arrived for the examination, prompting an investigation" Gamini said. He said investigations had later revealed that the address in the import papers belonged to a deceased person in Colombo 12. "Several individuals connected with the consignment were later taken into custody in the Orugowatta and Elakanda areas. At the time of arrest one person had in his possession documents pertaining to the importation" he added.